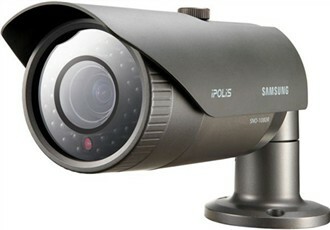 The Samsung SNO-1080R VGA weatherproof IR camera for monitoring wide range of outdoor applications. This has an analogue video output port enabling conventional analogue control device to make set-up on site easily and save installation time. The SNO-1080R supports dual H.264 / MJPEG codecs to provide a high quality recording solution and seamless monitoring with its frame rates of 30fps. The SNO-1080R features a varifocal lens and smart compression function to save installation time and bandwidth by capturing greater details only for the regions of interest. Automatic gain control adjusts the signal strength to maintain a constant brightness level, and auto white balance adjusts the red and blue signals by taking a standard white color reference to get the most natural colors.It also features digital noise reduction along with face detection function detects the position of the human face and the information is sent by video stream. The Samsung SNO-1080R has many exciting features for users of all types. See the Samsung SNO-1080R gallery images above for more product views. The Samsung SNO-1080R is sold as a Brand New Unopened Item.